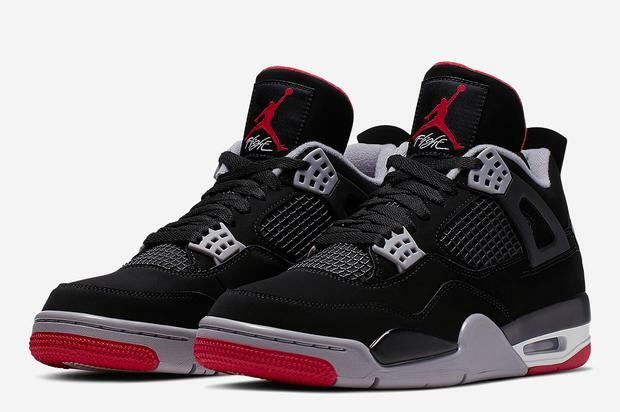 If you’re a sneakerhead, then you know by now that the Air Jordan 4 “Bred” is slated for an official release date of May 4th, 2019. It’s going to be one of the biggest releases of the year as the shoe returns in its OG form for the 30th anniversary of the silhouette. Everyone loves this shoe and its simple aesthetic proves that it will forever stand the test of time. While many of us anxiously await its release, Nike had some other plans as they decided to pull a fast one and drop the shoe early through the Nike SNKRS App in a Quickstrike release. The shoe will still drop on May 4th but Nike wanted to give those who were fast enough a shot to buy the shoe a little early. Sneakerheads rushed to their phones when they received the notification about the shoe, although as is usually the case with the SNKRS App, the vast majority of people took a huge L.
Thankfully, sneakerheads who want the pair will be able to cop them on May 4th, although stock numbers haven’t been confirmed. It’s not yet clear whether or not they’ll be an easy, medium, or hard cop. Let us know if you got through.